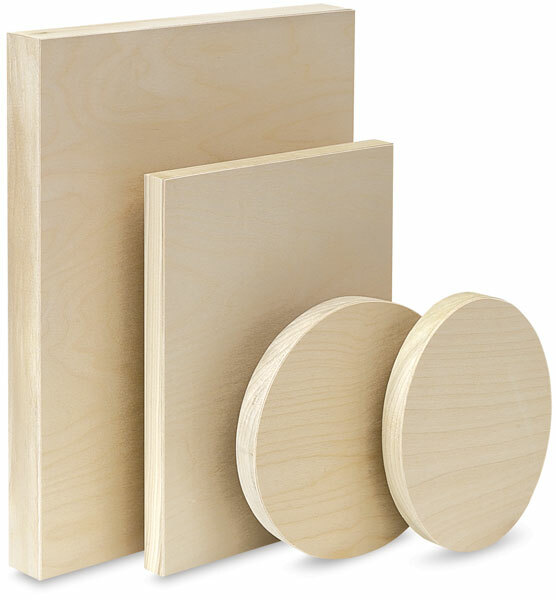 American Easel's wood painting panels are manufactured in the USA from top-quality 1/8" birch, which is sanded to render a smooth, firm painting surface. Cradled with a solid wood frame, these panels won't flex, stretch, or warp, and they'll last longer than a canvas. Their sanded edges also allow your painting to flow beyond the face of your work. American Easel's wood painting panels accept virtually any medium and are ideal for showcasing detailed or fine brushwork. Although priming is not necessary for some applications, the panels can be primed with gesso. Available in rectangular or square formats in a variety of sizes, choose a Flat cradle (7/8" deep) or a Deep cradle (1-5/8" deep). Or choose from a variety of popular square sizes that feature an Extra Deep cradle (2-1/2" deep). Economy (3/4" deep), Oval (7/8" deep) and Round (7/8" deep) painting panels are also available. When your artwork is completed, American Easel's wood painting panels hang flush to the wall using only a single nail or screw. No frame is needed!